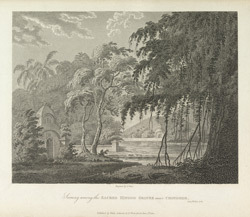 Plate seventy-three from the third volume of James Forbes' "Oriental Memoirs". The district and town of Chandod, on the banks of the River Narmada, was also under Forbes'(1749-1819) jurisdiction when he was Collector of Dhaboi. Considered a particularly sacred place to the Hindus of Gujarat, it had 'immense groves of ficus religiosa (Banyan) and ficus indica (Peepul) overshadowing numerous Hindoo Temples and spacious lakes', which 'cast a more than common gloom on this venerated spot...two-thirds of the inhabitants are brahmins and devotees of various descriptions'. Forbes 'lived near four years within a few miles of the solemn graves where those voluptuous devotees pass thier lives with the ramjannees, or dancing girls...'.